Maria and her family are very friendly! Location is very good to visit the island and the wiew from the balcony is wonderful to look at sunset. Bed sheets and towells were changed every 3 days. OK! Zoe and Georgios are 2 gorgeous old people who only speak Greek but they are extremely friendly. And if Maria, their daughter, is there, she takes care of everything. Cake and a bottle of cold water on arrival. A Greek plate (Gigantes) as a surprise. And 2 days later another piece of cake. Transport to the port arranged by Maria at a (very) decent price (Way cheaper than a taxi). La posizione è ottima, in centro al paese con un bellissimo balcone vista mare. Le camere sono molto ampie e dispongono del necessario sia per la cucina che per il bagno. I proprietari sono molto gentili e ci hanno lasciato anche dei dolcetti fatti in casa al nostro arrivo. Die Lage des Zimmers, super Aussicht vom Balkon, Nähe zum Ortskern, trotzdem sehr ruhig. Arkasa absolutně vyhovovala tomu co jsme hledali.., tedy klid malého městečka, ale zároveň možnost stravování v místních tavernách. Poměr cena/kvalita ubytování je výborná. Ubytování je situováno kousíček pěšky od centra městečka. Úklid na velmi dobré úrovni, každý druhý/třetí den výměna ručníků.. Taktéž výměna povlečení na postelích pravidelná. la proprietaria Maria è una persona eccezionale, disponibile simpatica : ci ha portato due volte parte della torta che ha fatto, poi avendo avuto dei problemi con il ritorno si è dimostrata estremamente disponibile ad aiutarci. Grazie Maria di tutto! Η Ηρεμία, η δροσιά του δωματίου, η κυρία Μαρία ήταν πολύ εξυπηρετική και φιλική. Il bellissimo terrazzino sul mare dove potevo tutte le sere ammirare il tramonto. La gentilezza della proprietaria la signora Maria. Lock in a great price for Zoe Studios – rated 8.1 by recent guests! Just 350 feet from Arkasa’s main square, Zoe Studios come with a well-equipped kitchen and a large private balcony overlooking the Aegean Sea. Agios Nikolaos Beach is a 10-minute walk away. The spacious studios come with a flat-screen satellite TV, iron, hairdryer and free WiFi. Each simply furnished studio includes toiletries in the bathroom. Heating is available in cooler months. During the summer months, free air conditioning is available. The property includes a garden. Bike rental is offered at Zoe Studios. Guests can cycle to Finiki, a traditional fishing village just 1.2 mi away. Free WiFi is available in all areas. When would you like to stay at Zoe Studios? 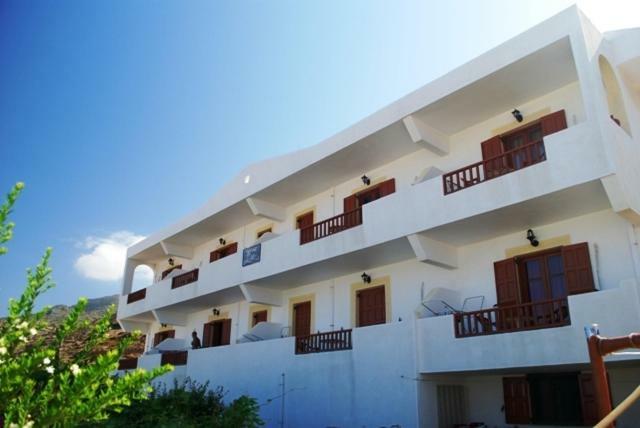 This studio comes with a well-equipped kitchenette and a large private balcony overlooking the village and the Aegean Sea. It also includes, free WiFi, a satellite TV, hairdryer and iron. Please note that double or twin bedding type, as well as upper-floor rooms, are subject to availability. Hosted by Miss Maria Giavasi (the owner). Miss Maria Giavasi (the owner). Our appartements are located very close to the centre of Arkasa and you can go everywhere on foot in a few minutes! From the verandas of all our appartements, you are able to see the sea all around you and also the picturesque village of Arkasa. Our appartements are quite large(30 square metres every appartement), so you will feel comfortable like home. There is air condition available in the studios and every studio has got a large private balcony. There is a satellite TV,an electric iron, a hair-dryer, electric devices for you to boil, cook or to make a toast.There is also a fridge in every room. Free Wi-Fi and free parking is available. I am Maria,I am a very friendly person and I really like to make people smile and feel comfortable and happy.I am a Biologist and I am interested in many things.I like travelling,cooking, walking and swimming.I like participating in traditional dances.Everybody says that I can find solutions to any problem quite easily.My daughters, who speak three foreign languages fluently, also helps me a lot.No matter from where you are,we are willing to help you to spend a nice time here in Karpathos. In our neighbourhood, there are many traditional Karpathian houses which you can admire and small roads where you can walk in order to see our beautiful village.The people are really friendly.The neighbourhood is near the centre of the village(2 minutes on foot) , where there are places to eat ,have a drink and have great fun, but there is no noise.The neighbourhood is peaceful and that's important especially if you want to relax.The archeological museum is in a 200 m distance.When you are out,you will see that the tradition is still alive.We will be very hapy to see you and your family. House Rules Zoe Studios takes special requests – add in the next step! Zoe Studios accepts these cards and reserves the right to temporarily hold an amount prior to arrival. Please note that air conditioning is available for an extra charge of 5 EUR per day from 1 September until 31 October. The host, Maria, was super helpfull and friendly! Just more cleaning in the room, nothing else!